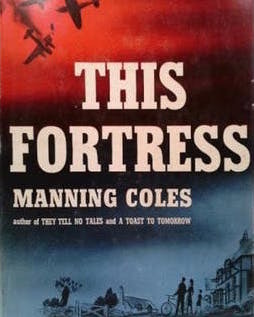 About the author (wikipedia): Manning Coles is the pseudonym of two British writers, Adelaide Frances Oke Manning (1891–1959) and Cyril Henry Coles (1899–1965), who wrote many spy thrillers from the early 40s through the early 60s. The fictional protagonist in 26 of their books was Thomas Elphinstone Hambledon, who works for the Foreign Office. Synopsis: While Tom Languish is serving in occupied Germany, he is billeted at Schloss Rensburg; home of Baron Alberich von Rensburg and his young wife Hildegarde. Tom becomes close friends with Hildegarde. He is demobilized and returns to England, and opens a small garage with his mechanic Griggs and housekeeper/cook Dimmock. He keeps in touch with Hildegarde by letter, learning that she and the Baron now have a son Otto. The Baron eventually dies. Tom visits Hildegarde. They discuss marriage, but cannot agree on where to live - Germany or England - and have an uneasy parting due to that disagreement. The borders close, and Tom loses touch with Hildegarde. He is occupied with his garage, and strikes up a friendship with Jessica Casey while England is enduring air raids from Germany. Mechanic Griggs is called up, and he hires George Mathews as a replacement. Mathews renovates a room above the garage and moves in. During an air raid, Mathews rescues two twin girls from a collapsed house and becomes a local hero. This is one of Manning Coles' non-Tommy Hambledon books. Not quite a mystery, nor a thriller, but a captivating tale of life in England during the war; and all the privations that came with it. Suspense comes in when there is suspicion of a German spy in the village. The events take a number of surprising turns at the end, with the final ending quite poignant and satisfying. It is easy to imagine reading this book with airplanes droning overhead as searchlights look for them. No dust jacket photo found. About the author (from encyclopedia.com): Pseudonym of Mathilde Eiker (1893-1982). As March Evermay, Eiker wrote three detective novels. Like British contemporaries, she minimizes brutality to emphasize motive and intellectual process. In They Talked of Poison (1938), scrupulous, sentimental Inspector Glover patiently solves a murder for a university seminar of expert suspects. In This Death Was Murder (1940), he explains three suspicious deaths despite the jealous quarrels and loyal deceptions of five sibling heirs. A final mystery, Red Light for Murder (1951), ended Eiker's writing career See also this biography. Synopsis: We follow the actions of our protagonist, Teresa Haskell. Her mother, Wealthy Marcella Humphrey of the lavish estate Pine Acres has just died as the story opens. Teresa and her four siblings gather for the funeral. It is awkward for them, as their mother had recently remarried - to Erich Humphrey - and had converted to his Catholic faith; of which they are unfamiliar. After the service, they gather for the reading of the will. They knew each would receive 1/5 of her substantial estate. All are surprised when Marcella's long-time attorney, Curtis Anderson, announces she had made a later will with a different attorney, Richard Hollis. When this later will is read, each of her children now only get $20,000 each, with the remaining $3 million going to her husband, Erich Humphrey. The shocked siblings discuss whether they should contest the will - and whether she was influenced by Humphrey to make it in his favor. Influence seems unlikely, Humphrey is a kind man of simple tastes, having moved from the estate to a small house and eating beans and bacon every day. His only plan for his windfall is to make some modest renovations to his home to allow him to paint as a hobby. Humphrey phones Teresa and asks to meet with her to discuss the fate of the Pine Acres estate. She goes to his home and finds him dead of a gunshot wound. While they consider the effect this will have on their inheritance, rumors surface that Humphrey was keeping a mistress on the side. An additional murder throws the inheritance-chain into confusion for the money-grubbing relatives. Oh, this was a looooong book. It could have been improved by editing it down to half the length. The unnecessary initial story line of the mother being poisoned was abandoned and faded away. After this false start, things slow down. The tedious middle portion of the book (with chapters subdivided into numbered subchapters) examines all possibilities in great detail. We are teased with the Teresa Haskell / Richard Hollis relationship which doesn't go anywhere. The denouement goes into far too much detail. The critical clue which breaks the case is pretty clever though. Tip for the reader: Anna Humfried and Frieda are the same person. Anna is her real name, Frieda is her stage name. This is not stated anywhere and it took a while to determine they are one person. About the author: Rufus King was an American author of Whodunit crime novels. He created two series of detective stories: the first one with Reginald De Puyster, a sophisticated detective similar to Philo Vance, and the second one with his more famous character, the Lieutenant Valcour. (from Goodreads). Also see this article. Synopsis: Mrs. Herbert Endicott fears for her husband Herbert's safety, although he has only been gone two hours - but to see his girlfriend Marge Myles. Mrs. Endicott calls the police and Lieutenant Valcour stops in. He looks around and discovers Endicott's body stuffed in his closet, the door closed. Mrs. Endicott takes it quite calmly, as if it happens every day. Dr. Sanford Worth is summoned to pronounce him dead, and he attributes the death to his poor heart (but if so, how did he get shut in the closet?). Apparently someone startled him, causing his death. They move the body to the bed. Dr. Worth decides to try to revive him with a shot of adrenaline to the heart, which works. Endicott's old war buddy, Thomas Hollander, is called in to sit at bedside until Endicott regains consciousness. The police keep a close watch, and Hollander produces a stiletto and begins to approach Endicott with it. The police shoot and wound Hollander. Endicott is found dead - again - this time from a gunshot wound. Hollander didn't have a gun, and it wasn't a police bullet, so what happened? "There it was again: that wretched wave of hearsay showing its baffling crest above the placid sea of established fact." and this one wins the Best Simile award: "Her voice was as disagreeable as the clash of dishes in a cheap restaurant." The entire story takes place over a 24-hour period, as we watch the authorities deal with an investigation instead of getting some sleep. First the police respond to a call from Mrs. Endicott because her husband has been missing for two hours - plus she knows just where he is - with the "other woman" (try that and see what happens). Then Endicott is found dead, revived, and murdered all in the space of a couple hours. His wife isn't too concerned about it anyway, just another day. It takes a long time for the doctor to prepare for the "operation" which consists of giving the dead man a shot; and requires a big cast of nurses and others to administer. It is enjoyable to follow the thoughts of Lieutenant Valcour, whose mind wanders away a lot. He likes to challenge suspects with made-up explanations just to see their reaction. The ending is quite ironic and enjoyable, and brings up deja vu for the reader. 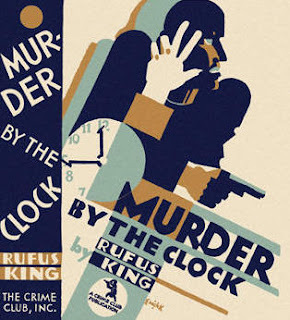 The "Murder By The Clock" title only refers to the various time stamps on the chapter titles, and has nothing to do with the plot. Elsa Verity - a "charming pretty little thing"
Synopsis: This is a story-within-a-story, as narrator Cyril "Pinkie" Pinkerton is writing a novel describing how a murder mystery party goes wrong with one of the guests actually winding up murdered. His novel, which he calls the 'manuscript' comprises the text of this book, which he had buried in a box but the police recovered and are reading as we go along. This manuscript is bookended by a prologue and an epilogue, in which he describes to the reader the setup for his writing it; and delivers the denouement at the end. Once you get your head around this awkward concept, it progresses as follows. John and Ethyl Hillyard operate Minton Deeps Farm - which, not being too profitable, is supplemented by John's writing of detective stories. At a gathering, it is suggested they put on a murder mystery evening for fun. Our narrator, Cyril 'Pinkie' Pinkerton, is one of the guests. Eric Scott-Davies, a wealthy ne'er do well, being a thoroughly annoying bully and disliked by all, is cast as the victim. Just before the play acting begins, he announces his engagement to girl-next-door Elsa Verrity - stealing her away from Cyril. 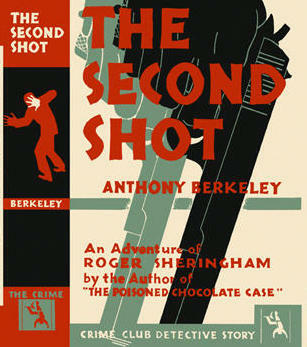 The play acting begins, and, surprise, after two gunshots are heard he is found dead. John Hillyard admits fired one innocent shot into the air as part of the theatrics, but who fired #2 which took out Scott-Davies? It turns out that all the guests had motive to do away with him. Since the body was found by Cyril, and he has the strongest motive (the engagement to Elsa Verrity), suspicion points at him. He calls in old friend investigator Roger Sheringham to help clear him. His love interest gets complex as he now ignores Elsa and begins taking up with Armorel Scott-Davies, cousin to the deceased Eric. As the investigation gets under way, we are treated to confessions from no less than four of the guests! It takes a bit of concentration to follow which of the account is the play-acting script, and which is the actual murder; but once we get the concept the book moves right along. I call Roger Sheringham a private investigator, but it is never stated who he really is. Since he is a series character, perhaps this occurred in an earlier novel. The narrowing down of suspects involves figuring who-where-when, and fortunately a sketch map is provided in my 1931 Crime Club edition. The retrospective narration in the prologue/epilogue is a precursor to the same technique in a couple of favorite noir movies: Double Indemnity (1944) and Sunset Boulevard (1950). If you enjoy those films, you will love this book! I am looking for more by this author - inexpensive paperback reprints are widely available but the original hardcovers are scarce.